Great photographs of many of the fire bombers at work; descriptive text; includes DVD. This book is a great addition to anyone’s library and in particular any person who is interested in Fire Bombers and their operation. This is a soft cover book and is a glossy publication printed in A4 format by Speciality Press of the USA. he book contains 144 pages with 120 black and white and 113 colour photographs. Throughout the book there are some great photographs of many of the fire bombers at work. While previous books about fire bombers have shown well known aircraft in action, this book gives readers the detailed story about how modern fire bombers actually work. The book contains dramatic never before published colour and black and white photographs showing fire bombing aircraft types from the 1920s to present day. Noted for his life long interest in this subject author Fredrick A. Johnson documents vintage and modern aircraft alike and includes detailed appendices giving every possible detail of the aircraft types and specific airplanes used as fire bombers. 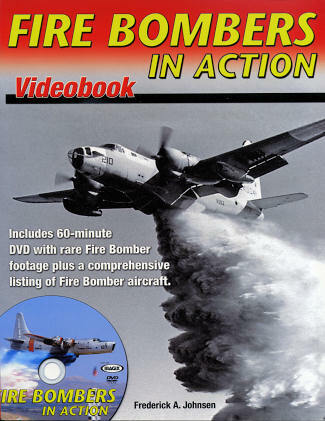 This book package also includes a DVD that has almost every film clip or presentation on fire bombers. The DVD to me is the most valuable part of this video book with many aerial clips of fire bombers both vintage and modern in action, some video walk arounds and even some great still shots. In summary, this is a very great book detailing the history of fire bombers and depicts a lot of information around the operations that very few people are aware of. The book is available from Specialty Press www.specialtypress.com or (USA) 1-800-895-4585 for US$34.95 plus postage and handling.